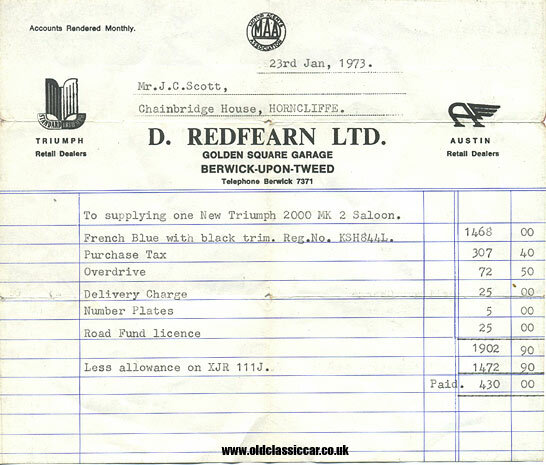 D. Redfearn Ltd sell a brand new Triumph 2000 Mk2 in 1973. Homepage. This page: Receipt for the purchase of a shiny new French Blue Triumph 2000 Mk2 saloon. D. Redfearn Limited operated as Standard-Triumph and Austin sales agents from the Golden Square Garage, Berwick-Upon-Tweed. This receipt was for the purchase of a new Triumph 2000 Mk2 by a Mr J.C. Scott, of Chainbridge House, Horncliffe. Mr Scott specified his new Triumph in French Blue, with black interior trim. Overdrive was also required, for which 72.50 GBP was added to the invoice. The basic car in 1973 cost 1468, on to which Purchase Tax of 307.40 was added, plus a delivery charge (25), number plates (5) and road fund licence (25). Evidently Mr Scott changed his car quite often. Against the new Triumph (KSH 844L) he part-exchanged a "J" registration car, for which he was given 1472.90. What car XJR 111J was isn't recorded. Interestingly, there is still a record of KSH 844L on the vehicle licensing database, although with a "Date of Liability" showing 1986, there's a good chance that the car was scrapped and DVLA simply not informed of the event. Perhaps this Triumph 2000 Mk2 does survive, languishing in a garage somewhere awaiting restoration? Any news on this car would be welcome. As for the car Mr Scott part-ex'd against the shiny new Triumph, there appears to be no record. As the business was still operating in the 1970s, does anyone remember buying a car at Redfearn's garage? In 1973 they clearly sold both Austin and Triumph cars, but maybe at other times they held other franchises? There appears to still be a garage in Berwick-Upon-Tweed trading at a Golden Square Garage, with an address of North Road Industrial Estate. Are these the same premises that the Triumph 2000 was sold from, or is this just a continuation of an garage name, but at a new location? Mr Scott's abode, Chainbridge House, or rather Chain Bridge House as it is now referred to, lives on as a great-looking bed and breakfast. Perhaps the old Triumph 2000 resides in a long-forgotten shed at the bottom of the b&b's garden!!! "Unfortunately, dad can't remember much at the moment about Mr Scott's various cars but he remembers Mr Scott and working on his cars. Dad (Jim) was the foreman of the garage. He also prepared Jack Stoddart's car for the Monte Carlo Rally, then bought it on it's return*. The garage ended up as a Renault dealership and was closed in the late 80s, when the manager decided to get rid of Renault and take on Peugeot. Unfortunately this didn't go through and the garage (and the workshop which had moved across the bridge to Tweedmouth) was closed in just a couple of weeks." *A photo of that car, a Standard Vanguard Phase 3 Sportsman, now features on this page, on OCC.